This post will be all about spring summer 2010 hair trends. 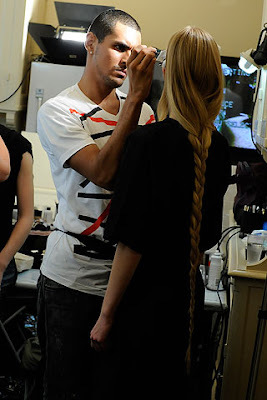 I adore fish tail braids/plaits in particular, but do try a classic side braid. There are also milk-maid braids as seen in Oscar de La Renta, which are amazing for those hot days when you need a break from long hair. Chignon & Up-do’s – sleek or messy high buns and twisted or tousled chignon, take your pick. 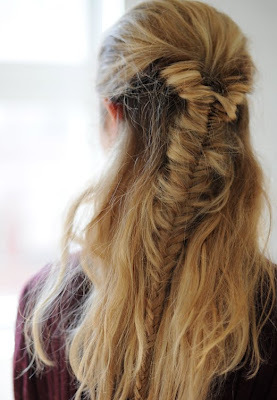 Messy up-do’s are the most wearable and easiest of all, this is also true with the braid trend. This season Fendi experimented with deformed and loosened topknots. Add glamor to your bun or chignon with accessories or embellishments to your liking. (Lanvin, Zac Posen, Fendi, Narciso Rodriguez s/s 2010) Also, check out Carolina Herrera and Chanel. Anna Sui had Boho 70’s inspired hair, either slicky straight with curled ends or wavy long locks. Tousled beach waves seen at Chloe. No summer is complete without beach hair, this is a total no brainer. Gucci and 3.1 Phillip Lim had hair slicked back with a side part, which I thought were OK. There were also slicked back trends that I didn’t like from MaxMara & Hussein Chalayan that looked greasy, wet at the root and dry at the ends. Something about it was not refreshing to me.